Description: Digital image from Kim E. Piersol original 35mm Kodachrome transparency. Trenton cut-off PRR stone arch tressle over the Neshaminy Creek, Playwicki Park. Description: CR 6440 - CR 3226 - CR 7797 - CR 3209 are the power for this unidentified westbound TV train with 89 cars and CR caboose 21125 as it passes through one of my favorite spots to spend the day watching and photographing trains for the day. 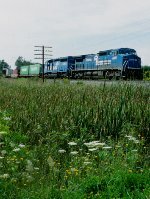 Between the Conrail trains and the smattering of NS trains on the old Nickle Plate line we used to average 3 freights per hour. 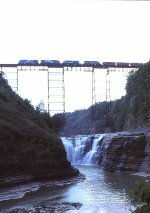 Description: An eastbound coal train crosses the Portage bridge as seen from the falls below in Letchworth State Park. This is the highest bridge on the Conrail system at 240 feet above the Genesee River. It was built by the Erie in 1875 after a previous wooden bridge burned. As I write this in February 2015, its still in service at 140 years old. NS plans to replace it with a new bridge just to the south of the present structure. At one time, the Pennsys Rochester Branch ran up through the gorge. Some of the right of way can still be seen if you know where to look, and bridge piers can be seen in the river from the NY 436 bridge at Portageville. That line was abandoned in 1962. Description: TV 26 rolls east past the cornfields of Arkport. Description: TV 26 has just climbed up out of the Genesee valley with its 5 COFC and 40 auto racks, where it crossed Portage Bridge, and is now approximately at the location of the ELs NT tower, where the River Line went west to join the main at Cuba Jct. That line is lone gone by now, but the traffic on the former Buffalo Sub is pretty good today.